Coach Garrido taught his players to stay in the moment (not the past) and focus on the fundamentals. He said part of coaching fundamentals is "Timing and rhythm...... These kids aren't machines. They have feelings: they have emotions. This isn't a game played by robots." A Reflection on Augie Garrido life is at the end of this site. One of the only coaches who has won the CWS as a coach and appeared as a player. In the summer of 2016, he was enshrined in the American Baseball Coaches Association Hall of Fame and in July 2016, he entered the National College Baseball Hall of Fame. While at Texas, Garrido coached 27 All-Americans and 102 players who went on to play professionally. Garrido Is One Of Only Two Coaches To Lead Multiple Colleges To A National Championship. If you have not read Augie's Bio titled "Life is yours to win" you should. Like DKR Augie had many insightful comments. Some of his wisdom is shared below in the history of Augie Garrido years as a longhorn. Coach had a different philosophy from most coaches in baseball . He believed that if the players mind was balanced then good baseball would follow. He taught the fundamentals of the game but focused on the players mental game. Without this balance of the two the players would have a tough time maximizing their abilities. In Augie's biography title Life Is Yours to Win he says “Fear and expectations can be crippling" mentally. “Fear will strike it always does, the emotion takes you out of the moment and into our own head.” The only way for a baseball player to stop a downward spiral is to quit pressing and return to playing the game. "Confidence overcomes fear but confidence is often fleeting while fear hangs on." The best way to control fear is to clear your head. Augie says we tell the players t9 "get outside of your head because that is where the competition is." Page Elizabeth Bauerkemper in her 2013 report titled Beyond Sports: A Guidebook for Potential Collegiate Female Student -Athletes agrees with Augie when she states "Changing the way athletes view pressure can change the way it is experienced." On the other hand expectations serve someone else and motivate from the outside in. If you try to live to other people's expectations you are dealing with things you cannot control. Accomplishing personal realistic goals help build character from the inside out. Lessons learned playing baseball are transferable to life after baseball. Baseball "doesn't give us what we pray for. It doesn't give us what we wish for. It doesn't give us anything other than OPPORTUNITY, nothing more , nothing less, and that is enough. In fact it's a great gift." Life gives most people opportunities, but it is what you do with this gift that will define your destiny. Coach Garrido said If both teams are equal in “superior athletic ability, knowledge of a games strategy , and master of its skills, success is usually claimed by those in command over the mental aspects of baseball" -fear and expectations. Page Elizabeth Bauerkemper in her 2013 report titled Beyond Sports: A Guidebook for Potential Collegiate Female Student -Athletes agrees Augie's states "Changing the way athletes view pressure can change the way it is experienced." A criticism from a Coach should not be construed as a personal attack but a "motivation to do well". In the 9 years with UT he has developed 10 Big 12 conference first team players and 9 All Americans. In 1998 Catcher Brian Johnson During A One Week Span Hits 2- 400 Plus Feet Homers At UFCU Field. Tommy Nicholson is named most valuable player on the Texas team. Sean Braswell receives recognition as a Rhodes Scholars. D.J. Jones wins the James Keller Sportsmanship Award. Charlie Thames is a All American. The pitching staff on this Team Holds The Record For saves (23) During The Modern Era. This team holds the Texas record for most total bases (1,186). Jeff Ontiveros holds the Texas career record for most games (260), most at bats (922), and most total bases (510) . Dustin Majewski holds the Texas career record for the highest batting average (.395) and he makes the All American team. Huston Street holds the Texas career record for most saves (41), he is a GOLDEN SPIKES AWARD FINALISTS, and an All American. Justin Simmons holds the Texas career record for number of starts (66), and is an All American. J.P. Howell is a CLEMENS AWARD FINALISTS and an All American. Augie says that the 2005 team was special because they had confidence and enjoyed playing the game. This team found a "fabulous balance of competitive genius and boyish fun." Tough road to the CWS. In regional play lost to Arkansas and Mississippi but fought back and won 5 elimination games to make it to the CWS. Seth Johnston holds the Texas season record for @ Bats (304), and hits (115) in a season, and is an All American. A special moment , a coaching decision, and a young player with a special spirit all make college football history. Chance Wheeless who suffered a shoulder injury the day before was scheduled as the lead off hitter in the bottom of the 9th against Baylor with the score tied 1-1. The Baylor team dominated the Horns during the regular season and Chance was hurt so Augie decided to send in a pinch hitter. Chance objected and convinced Augie that he knew the Baylor pitchers tendency better than anyone, and he could handle the shoulder pain. There was a collective moan from the fans and announcers when Wheeless stepped into the batters box. No one could believe that Augie decided to allow the injured Wheeless to lead off but with the count at 1-1 please view the following video to see what happened. 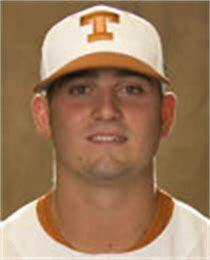 David Moroul was the 6th player from the Longhorns to win the College World Series Most Outstanding Player. The others are Tom Hamilton, Mickey Reichenbach, Calvin Schiraldi, Huston Street and J.L. Smith. Augie calls David a super hero because he was the weakest link on offense and the strongest link on defense who put on his superman cape for the CWS to bat .500 including 2 home runs, scoring 8 runs, commiting no fielding errors. J. Brent Cox is an All American and the winner of the NCBWA STOPPER OF THE YEAR AWARD. Drew Stubbs- 2006 drafted First round. Drew Stubbs is an Academic All American in 2005 and 2006 and a GOLDEN SPIKES AWARD FINALISTS in 2006. Taylor Teagarden is a JOHNNY BENCH AWARD FINALISTS. NCAA limits full baseball scholarships on a team to 11/7. The Longhorn travelling team consist of 25 student athletes so more than half to the team players are on partial scholarships. Michael Torres sets game hitting streak record of 25 games. A team that started out as the Bad New Bears (not a compliment) morphed to what Augie says is his best "small ball" team ever. Ever member of the starting lineup had at least 6 sacrifice bunts. The players were unified in the strategy needed to win. Sports writers were confounded by the 2009 teams success. It was a team that did not win with averages and percentages but with a spiritual bond and a sensed of destiny. The team ranked 210th in home runs with a batting average that was next to last in the Big 12. This team only won the conference championship because the opposing team had a plane to catch . Augie says with humor that the Longhorns had discovered divine intervention from the "Church of Baseball " . This team did what they needed to do to win- "walk, sacrifice, homers, small ball, long ball, bunts, balks, and acts of nature" A team that was "offensively challenge" was winning on "pitching and magic". This team should be presented with the record for most "improbable wins". May 30 2009 Boston College and UT played in the longest game in College baseball history. The game lasted 25 innings and 7 hours and 3 minutes. Austin Wood threw 13 scoreless innings in relief and the opposing team players stood and clapped for his performance. Austin Wood sets a Texas career record of 118 appearances. Augie says that Travis Tucker was one of the best hitters and a true leader for the 2009 team. According to Coach, Keith Shinaberry was a free spirit and a natural leader. He suggested to coach Garrido that his coaching style was too complicated and ask Coach to try and keep the game simple. Coach Garrido did as instructed, and the team started to win. Russell Moldenhauer was benched early in the season because of a batting slump and a injury. He is then promoted to clean up hitter during the CWS game against Southern Miss. He delivered with 4 home runs during the CWS. Augie said this team of 2009 " not only defied explanations, they defied natural law." Even though this team finished runner-up Coach Garrido knew this team would receive more adulation that most teams who lose. The Horn fans treated this team as the greatest non-champion of all time. Bill Little said this team was loved because of "who they became , and the fact that they took us all along for the ride." "They were totally human , and absolutely fun" to watch. This Team Holds The Record For most home runs (81) and most strike-outs (482). Garrido says this team had the "best and deepest pitching corps we've ever been blessed to coach". So deep that they had to ask Chance Ruffin who was in the starting pitching rotation in 2009 with a 10-2 record to act as the "closer" in 2010. His father was also a Longhorn on the 1983 National Championship team. All time Attendance record is set with 273,029 fans attending home games. Garrido is inducted into the Omaha College Baseball Hall of Fame. The attendance records are broken for a two game series (14,846) against Houston, and a three game series (19,727) against TCU. When Augie was hired at Cal State Fullerton he had no scholarship to offer , no lights on the field, and no locker room. The players changed to baseball gear in the parking lot. Budget was $4000 and raised to $6000 when Cal moved to Division I . His second season the team made it to regionals but Cal had no money so he placed a second mortgage on his home to fund it. Kevin Costner cast Augie as the NYY manager in the movie "For Love of the Game" . Augie Garrido- "Pressure is a choice"
Augie left a legacy of wins, laughter, and leadership. Mack Brown said “He really made you think, made you laugh, and always was so much fun to be around....."
Rick Barnes said " I loved him more as a man than I did as a baseball coach. We lost truly a beautiful personality......." When Coach Barnes was struggling with his team, Augie helped Coach Barnes with perspective needed related to personal focus and dealing with pressure. Coach Garrido told Barnes that after winning the National Championship at Fullerton the "... next year, he put so much pressure on his team" that his mom got involved. She had a picture, and said, "you notice when your guys won the championship, you're holding the trophy. Why don't you let the kids hold it." Augie said, "'I realized that day that it really is not about me." The true key to success in college coaching is " can you get your guys to play like little boys that love the game.'" In 2009 he reflected on his change in attitude by saying "I am a teacher by nature, but I am no better or more important than the kindergarten teacher or the high school coach." Shaka Smart said "Augie was a mentor of mine during my first couple years at Texas....." "I knew Augie really well. He kind of took me under his wing when I first got to Texas. He came over to practice. A lot of people don't know this, but Augie is a basketball guy. Augie played basketball. That was kind of his first love." He cultivated Oregon head coach George Horton, who has won more than 1,000 games, Fullerton head coach Rick Vanderhook, and Skip Johnson at Oklahoma. As assistant coaches he influenced Arizona recruiting coordinator Sergio Brown and Stanford’s Tommy Nicholson. He was even friends with Kevin Costner and had a role in "For Love of the Game" as the Yankees manager. Garrido was also the subject of Richard Linklater’s ESPN documentary “Inning by Inning: Portrait of a Coach” and hosted “Home Plate with Augie Garrido,” a cooking show on the Longhorn Network. Garrido says in his biography he loves home runs, no hitters, and spectacular fielding, but he knows that most games are won by “small ball”- getting ahead of the count, taking a walk, sacrifice bunting , making productive outs, and choosing the proper pitch for the proper moment.. The players I let down. The players that had lesser roles who needed more from me and I didn’t know it. Coach Garrido's contributions to Longhorn traditions represents a portal to the past that remind Longhorn fans that heritage shapes the present and empowers the future. To self-correct, you have to self-assess. Fears are feelings , not facts. You can refuse to give them power. Parents of young kids mean well but sometimes parents live vicariously thru their children and put undue pressure on them to succeed. The result too often is that the young men never develop the self-confidence and self-respect necessary to guide their own lives. " The worse thing parents can do is withdraw their love if the child doesn’t meet athletic expectations." Augie wisely notes that as we grow into imperfect men ourselves, we appreciate our fathers even more because we better understand them and the challenges they faced. It is important to play baseball like a kid caught up in the game. ”We will strive for perfection, but you will fail”. It takes courage to keep striving after you fail. If you spend your life seeking approval or rewards from others- whether it is love or their acceptance- you will never find the fulfillment that comes from accepting and loving yourself. Rather than following in our fathers’ footsteps, we chased their dreams. We have found that most of the learning that takes place in both life and baseball occurs when there has been a failure. In baseball and life “homers get all the glory , but bunting is the essence “ of all. We tend to accrue limits as we age, either because we put limitations on ourselves or we accept those placed upon us by others. People who can blast thru these limits are a rare breed.